CAN WE GET A KALE YEAH!!! I spotted that slogan on a billboard for Naked Juice in Boston and knew I was going to be making kale soon. Kale, also known as the ‘Queen of Greens’ is the culinary darling of the moment although I have not personally gone kale crazy. I like kale all right but I just like other leafy greens better. 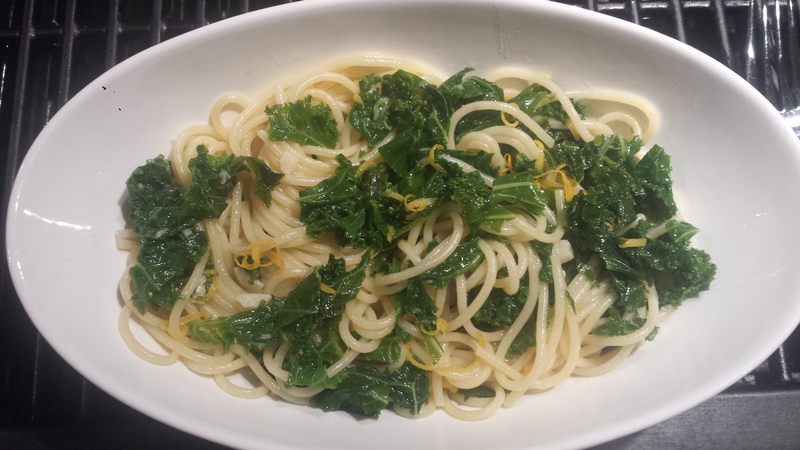 That said, I really like this garlicky, lemon, kale pasta dish that I adapted from ivillage.com . It’s very simple, only six ingredients, allowing each flavor to shine, and can be made using only one pot. I normally don’t like boiling vegetables since nutrients are lost in the water, but in this case, the pasta is cooked in the salty kale cooking water and the resulting pasta is way more flavorful than when just cooked in plain water. 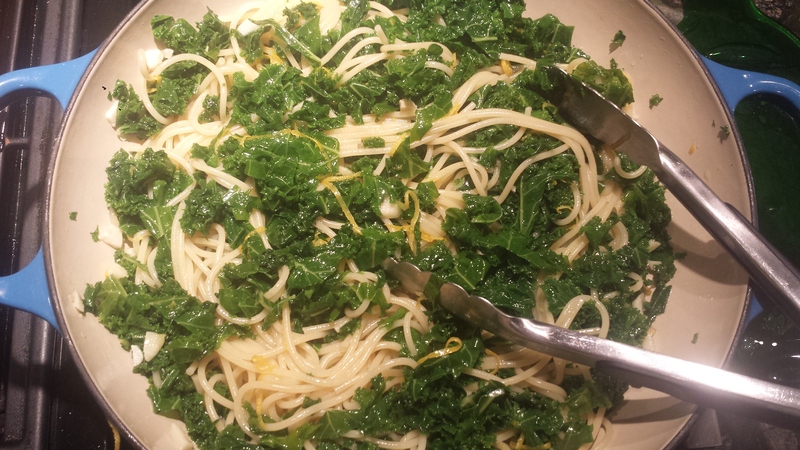 The pasta definitely absorbed some of the kale flavor, and hopefully some of the nutrients as well. Want to hear more about kale? Did you know it is closer to the cabbage and broccoli families than chard or other leafy greens? It’s kind of like a wild cabbage whose leaves don’t form a head-a bit of a free spirit. Kale is a great source of fiber and an excellent source of antioxidant vitamins A, C, and K , as well as many important phytonutrients. In selecting kale, smaller leaves are usually more tender and less bitter than larger leaves but you may need to use more as the yield will also be smaller. The center rib is edible but very fibrous, so unless the kale is going into a soup where it gets cooked for a while, the rib is usually removed and discarded. The photo below shows curly, dino (lacinato) and purple kale. 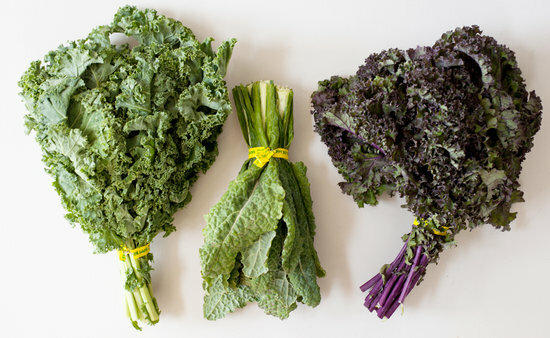 Click HERE for more info on the different types of kale. 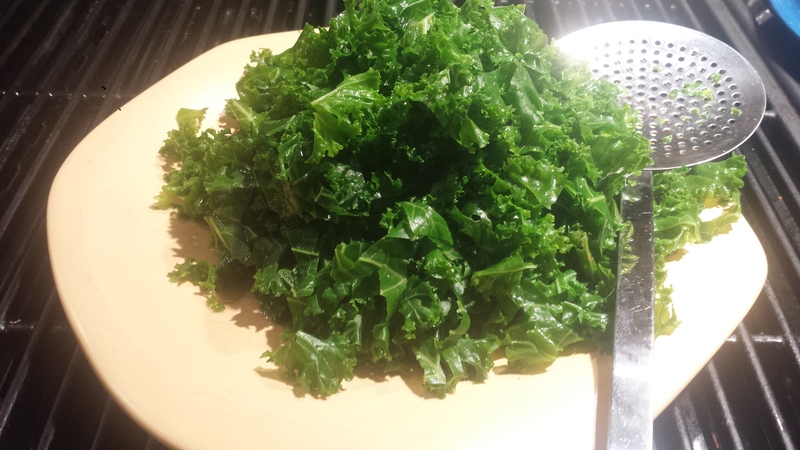 TIP: I used curly kale but dino kale, or any other type will work just fine. Curly kale is a bit more bitter and fibrous and may need to cook longer than other types. There is a perfect point in cooking kale where it is tender and the natural sweetness comes out. 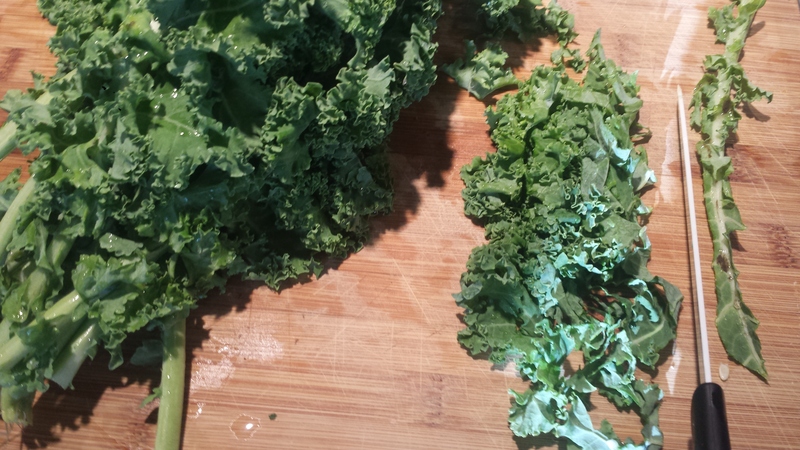 Cooked too long, kale can get bitter again and it loses it’s beautiful bright green or purple color. Spinach may be substituted for non-kale lovers. Just use twice as much spinach since it shrinks so much during cooking. If you want to add some protein or make this a heartier dish, stir in a cup of cooked white beans. Since I was cooking this dish for myself, I reduced the ratio of pasta to kale because I like extra veggies. 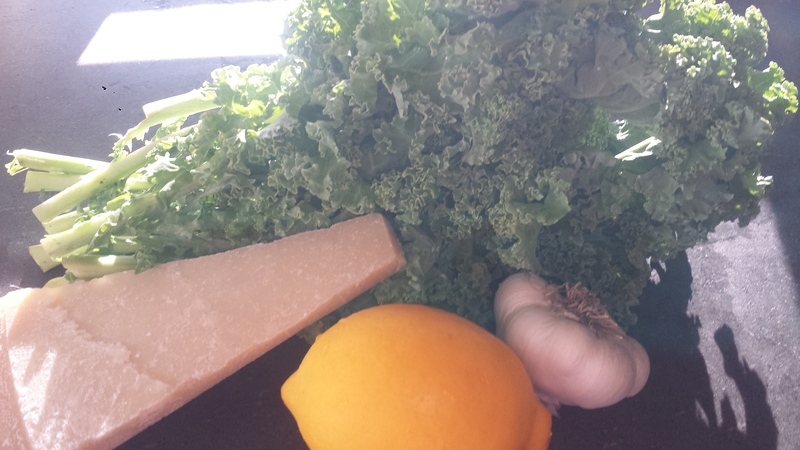 Remove the tough core and stem from the kale and slice into ribbons. Wash and dry lemon (drying with a cloth or papertowel removes any residual debris). 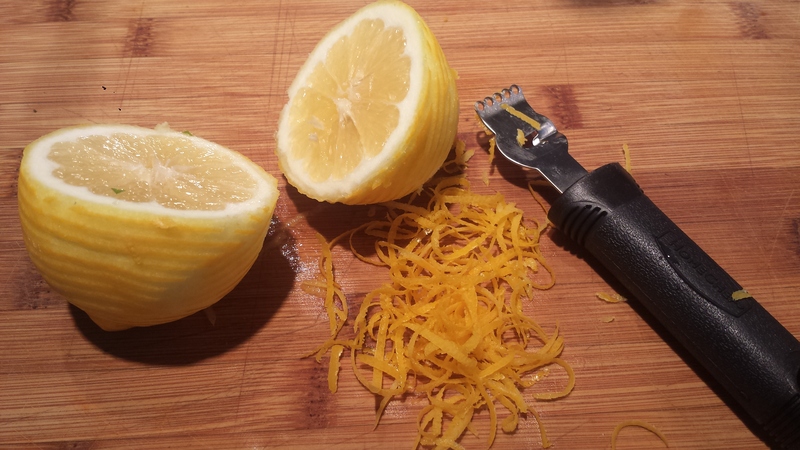 Zest the lemon before cutting in half to juice. Bring a large pot of salted water to a boil over high heat. Add the kale and cook for about 5 minutes, stirring occasionally, or until tender. 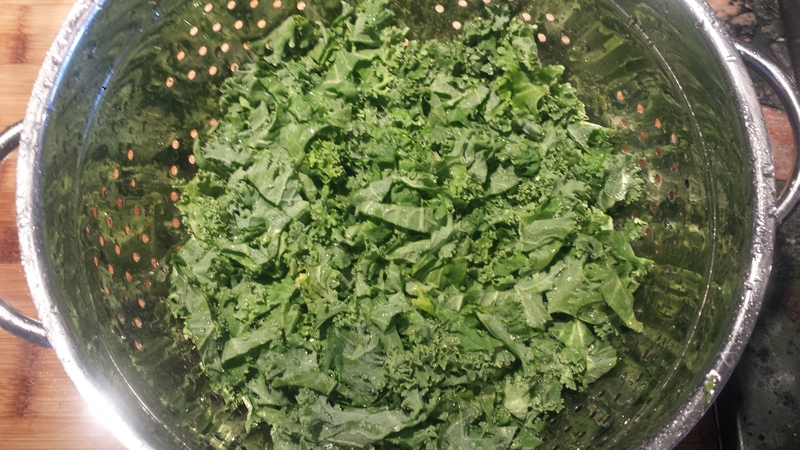 Using a mesh spoon or sieve, scoop the kale out of the water and transfer to a bowl or platter. Return the water to a boil. Add the spaghetti and cook, stirring often to ensure it doesn’t stick together, for about 8 minutes, or until tender but still firm to the bite. Scoop out and reserve 1/2 cup of the pasta cooking water. Drain the spaghetti. Heat a large heavy skillet over medium heat. Add 1/2 cup of the olive oil and the garlic and cook for about a minute, or just until fragrant. 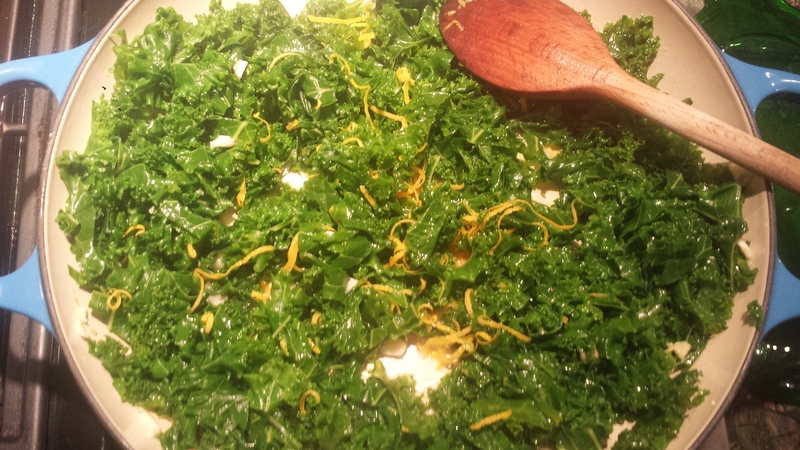 Stir in the kale, add the lemon zest, and season with salt and pepper. Add the spaghetti and the remaining 1/4 cup olive oil and toss to coat. Stir in the lemon juice, followed by half of the Parmesan cheese. Season to taste with salt and pepper. Stir in enough of the reserved cooking water to moisten the pasta as necessary. Divide the pasta among four pasta bowls, top with the remaining Parmesan cheese, and serve. 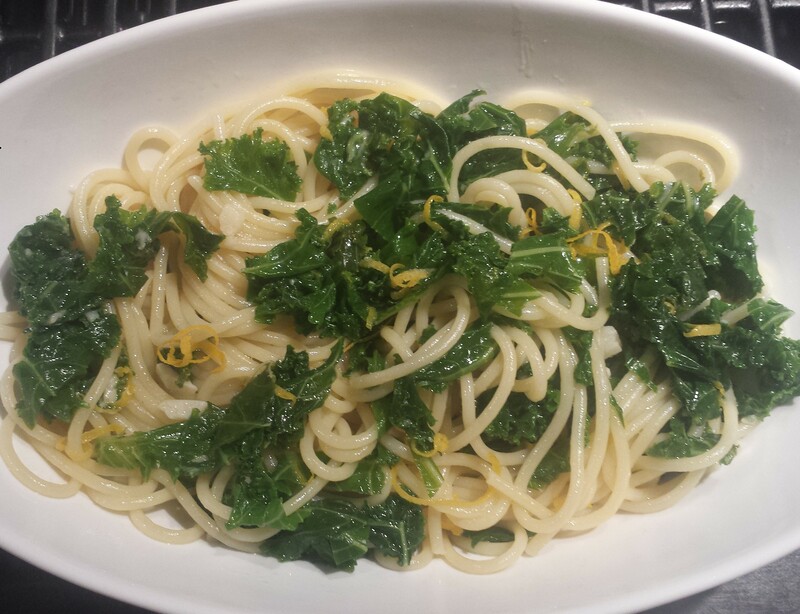 This entry was posted in All Recipes, Meatless Monday, vegetarian and tagged curly kale, garlicky kale, Garlicky Kale Pasta, kale, Kale Pasta, Pasta with Kale, Pasta with Kale Lemon and Parmesan, Spaghetti with Kale, vegan option, vegetarian. Bookmark the permalink.